to quickly open your trackables mission page. QR Tags There is 1 product. How many times have you found a travel bug in a geocache and you had no idea what its mission/goal was? 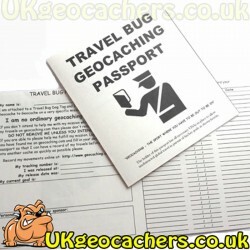 With a travel bug passport geocachers will be able to see at a glance what your bugs goal is and can even enter their information in it as a permament record of their assistance.